DAMN!!! Back in the days when I was an active shooter, I'd have given my left nut for the opportunity to buy a bull barrel for my 10-22. I used to have a stainless bull barreled one. Traded for a 1911. Yeah.....that trade was worthwhile on several levels - I'd have done the same thing! S&W SW1911TA E Series. Beautiful gun nd shoots like a dream. Both are winning pieces. I like the long trigger of the original 1911, however the arched spring housing of the 1911-A1 nestles in my hand just a tad bit better. 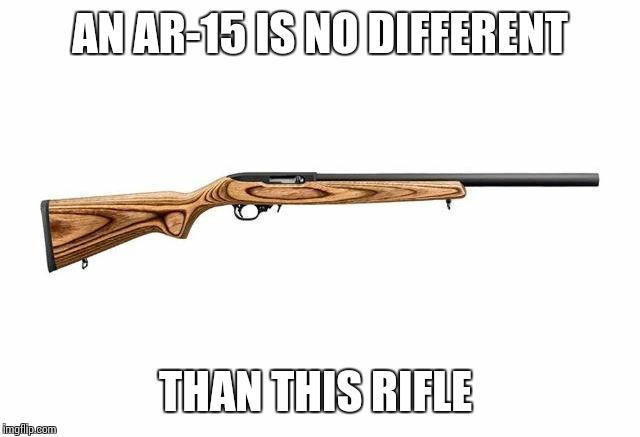 Functions the same, has a detachable magazine the same, projectiles only have a 0.003" difference in its diameter, and I could kill a deer with both of them. Major difference, is the appearance. I am listening, I know them already that is why I posted that. So let's hear them. The rifle pictured and an AR-15 has the exact same assortment of magazines that can be utilized. I remember seeing 50 round magazines for these in the sporting goods stores hanging on the shelf near the arrows in the early 90's. And the function of this rifle (1 trigger pull = 1 round fired) is semi automatic, just like the AR-15. It *IS* unlike the M16A1 that has semi and full auto select fire and unlike the M16A2 which is semi and 3 round burst select fire which is the same as the newer variants (M16A3 & M16A4). Those are military firearms and are regulated. The AR-15 only has the same appearance but functions operates the same as the one pictured. That is like saying any car that is painted red is a sports car, the only thing similar is the exterior appearance. First, no firearm is sold with a "standard drum". The typical magazine sold with an AR-15 is a 30 round magazine. Except in California and states that have magazine restrictions hat sell the rifle with 10 round magazines. I think you may have some of your terminology mixed up. Drums are available for aftermarket purchase for both rifles. Secondly, both do the same thing, they expel a projectile out the end of the barrel towards whatever they are aimed at. Their self loading action both do the same thing and they both have a large selection of magazines that can be utilized in operating that rifle. There is no difference in their action and operation. What they are used for is up to the person operating it. So you are saying it should be banned solely on how it looks? I have a neighbor that has a car painted with racing stripes. It also has a front air dam and a spolier. Things designed for race cars. It is illegal to race on public streets so he does not need those attachments on his car. I demand it be taken from him. You could turn that into a meme if it hasn't been done already? What about the other rifle I posted a picture of? By definition, they are both magazines. However, "drum" is a layman's term to differentiate between a normal magazine and a magazine that coils the ammo over into a cylindrical magazine, appearing to be a drum shape.